The UNC Board of Governors has pushed the deadline for a proposal on the fate of the Silent Sam Confederate monument to its May meeting, according to a letter from board Chairman Harry Smith. “In order to give our team the time they need to do their work, I am extending that [March 15] deadline and asking them to report back to the Board at our May 2019 meeting,” Smith wrote in an e-mail to board members. 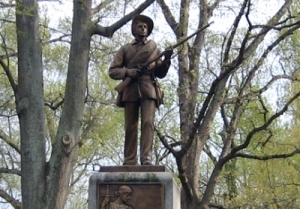 Back in December, the board rejected a controversial, $5.3 million plan to return the Silent Sam Confederate statue to the campus of UNC-Chapel Hill as part of a UNC History Center at the edge of campus. The board then formed a task force of Board of Governors members to help the UNC Board of Trustees put together an alternate plan to be presented to the full board by March 15. That decision was followed by the abrupt resignation of Carol Folt as Chancellor at UNC-Chapel Hill. She announced in her resignation letter that she had ordered the base of the statue, which was toppled by student protesters last August. The move angered many members of the Board of Governors who felt Folt had overstepped in giving that order. Since then both UNC System Interim President Bill Roper and UNC-Chapel Hill Interim Chancellor Kevin Guskiewicz have said they believe the statue should not return to campus. Below, a timeline of the ongoing saga of the statue and related political controversies. February 6, 2019: Roper appoints Kevin Guskiewicz, dean of the UNC-Chapel Hill’s College of Arts & Sciences, as the school’s interim chancellor. Guskiewicz, who says he will seek the position on a permanent basis, says he believes the monument should not return to the campus.